Laxmanpur Beach in Neil Island is another primary attraction after the Bharatpur Beach. Create a visual poetry of abandoned senses and gentle beaches, the warmth of the sunrays and the dazzle of the blue seas. As you gently tread along through the beach sands, you come across the lovely colourful heaps of dead corals and loads of sea shells heaped along the waterfront to entice and enamour the outlanders. This beach is known to a rocky beach and is not recommended for swimming into the swallow waters. But this beach provides ample scope of an enjoyable snorkelling session. The beach is lined with beach shacks that offer delicious fried mixtures, namkeens, pakoras, fish fry, sea food dishes and maggi to go with a steaming hot cup of tea or coffee or a chilled cold drinks depending upon the mood and weather of the tourists. It is a memorable feel to get to the beach front a little before the dusk to watch the golden rays of the sun disappearing into the vastness of the ocean. Gaze at the changing colours of the sky every second as the sun goes for its daily downward journey. He visual treat is too fanciful to forego. The seas and the sands equally revel in the mirth of golden sunset and reflect the furious crimson of the golden sun to add to the enchantment. As dusk falls along the beach, the beach grows increasingly mysterious. With the sea relentlessly hitting the shores, the Laxmanpur Beach is a treat to senses even after darkness descends. Watch the couples enjoying the sea view, the children playing with wet sands building beautiful castles, the elderly couple resting in some shaded corner and the some enthusiasts bobbing up and down wrestling with the seas. Watch the crowd increasing in number at sunset is about to fall. And sit in its shores to listen to the silence of the seas and the melting of the waves. The beach is quite long and stretches enough to provide ample privacy to all who cares to visit its shores. As you watch the setting sky putting the sea and sand on fire, you feel that your day has been worthwhile. 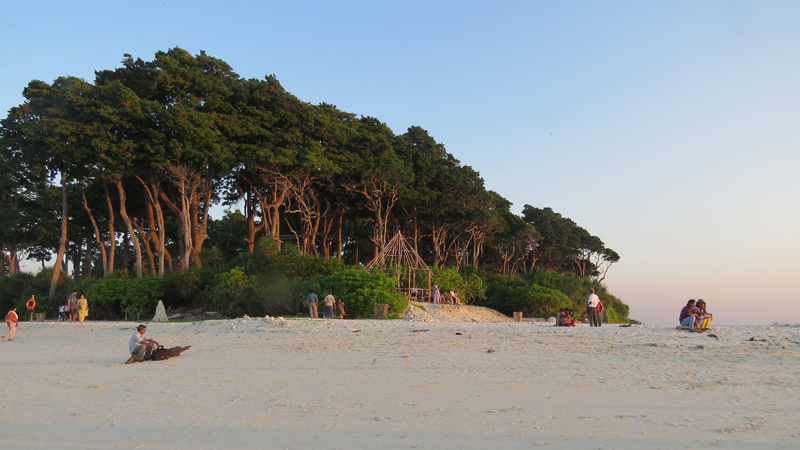 This is one of those beaches which you simply cannot miss while you are in Andamans.